For scientists investigating biological processes by characterizing samples in terms of relative protein abundance and posttranslational modifications. For scientists involved in the development or use of immunoassays aimed at monitoring Host Cell Protein (HCP) impurities in biopharmaceutical products. Designed to detect statistically significant differences in protein expression between experimental groups, with high objectivity, sensitivity and confidence. 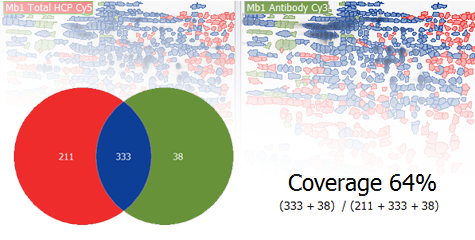 Designed to analyze 2D-PAGE based coverage, i.e. the percentage of immunodetection that an antibody reagent offers for the total population of HCPs. Still innovating after 30 years! We’re thrilled to present our new and expanded Melanie 9! Its new Coverage module and a range of added functionality and clever improvements will help you draw more reliable conclusions from your 2D electrophoresis gels and Western blots. If you are looking for tools to characterize HCP impurities in biopharmaceutical products, check out our module for Coverage Analysis. Are you rather wondering whether your protein expression differences are real? Don’t guess; our Differential Expression Analysis solution saves you time and money otherwise wasted chasing false positives. 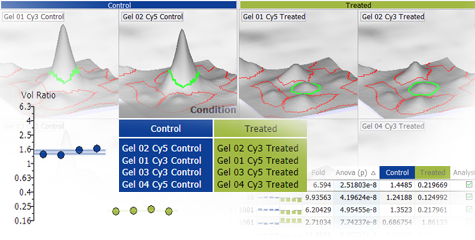 You want to learn more and see how easy, fast and reliably you can obtain results from your 2D gel and/or blot images? MelanieTM offers significant time savings with the intuitive step-by-step workflow. Tools dedicated to each analysis stage let you feel confident that you accomplish the necessary steps and checks for the highest quality results. MelanieTM gives you full liberty over how you want to group and layout your images for viewing, and lets you choose your preferred combination of 2D and/or 3D views. No other software allows you to adjust the specific views with such ease and flexibility. MelanieTM supports any type of staining, including colorimetric, fluorescence and functional group specific stains, as well as DIGE images or western blots. Similarly, all common image formats can be analyzed, including TIFF, GEL, MEL, IMG, GSC and 1SC files. The free viewer functionality permits you to easily share your work and scientific discoveries so you can collaborate with colleagues all over the world. Discover our product's key features and how you can benefit from them. Download a fully working version and try it out. Browse our various guides, FAQs, blog posts and other resources. Take a look at the flexible product and licensing options and find a supplier.